So, uh, how do people start these things? Saying “welcome to my new blog” seems sort of silly – like, should I be throwing a blog-warming party? – but I feel like some sort of introduction and explanation is in order. As noted in my profile, I spent around 20 years involved in various aspects of the electronic and experimental music scene. I started out as a music reviewer at the student newspaper at the University of Waterloo, and spent time in the years that followed as a club DJ, zine publisher, concert promoter, magazine columnist, record reviewer, radio DJ, and record company owner – many of these in conjunction with my lovely and patient wife, Sheryl Kirby. However, one after another, these various projects came to an end. In the last few months of 2005, I quit my radio show Feedback Monitor after nearly a decade on the air, we shut down the label, and I set aside the writing. I felt like I’d hit a wall, and needed some time off to recharge – not to mention help Sheryl recover from an accident she had in the fall, and deal with an unexpected house move earlier this year. My plan was to take a break for a few months, and then revive Feedback Monitor as a podcast and blog covering the same sounds I’d featured on the radio show. But as I started work on the first instalment back in the spring, I still wasn’t feeling the spark that I used to get from doing the old show. So rather than slog away at something that I wouldn’t enjoy, I decided it was time to officially “retire” from my “career” in music. Running parallel to all of this was my interest in good beer – an interest that also started when I was going to school in Waterloo at a time that coincided with the start of Ontario’s modern craft brewing culture. Waterloo was at the epicentre of the scene in the early days, with Brick, Sleeman and Wellington all located in the area. It didn’t take me long to realize that there were better beer options than Labatt and Molson, and I’ve spent the following two decades – and the last few years in particular – exploring the world of microbrews and craft beers as much as possible. Which brings things back to early 2006, where as I was winding down my involvement in music-related activities, I started to ramp up my involvement in the local beer scene. 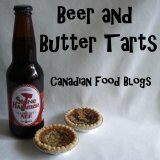 I became the news editor at Ontario’s top beer website, The Bar Towel, and then got the opportunity to write regular beer articles for Toronto food and drink webzine Gremolata. Working on these projects brought back the spark I’d lost, and got me interested in writing even more beer-related stuff, some of which wouldn’t really work on either of those sites. I also got a bit of the music bug again, although not as strongly as I had it before. And thanks to discovering RSBS (Really Simple Beer Syndication), I started reading a bunch of beer blogs, and found the format inspiring. The end result to all of this was the blog that you’re reading right now. Beer, Beats & Bites will primarily be a forum for me to post beer-related material that doesn’t fit in on the Bar Towel news feed or my Gremolata columns. This will include more detailed beer reviews than those I post on Rate Beer, thoughts on industry news and developments, festival features (watch for a report next week from this weekend’s Michigan Brewer’s Guild Summer Festival and the surrounding roadtrip), book reviews, and whatever else passes from my fingers to the keyboard. Music will take a smaller role – I’ll post a review if an album really moves me in some way, not just for the sake of doing so, which is how things were in the old days. And being a bit of a foodie, I’ll throw in the occassional restaurant or cheese review as well. For the most part, though, it’ll be about the beer. Speaking of which, I think I’ll go have one now. Hopefully, you’ll stick around and join me.